When You Know About Us, You'll Choose Us. Here's Why. A.J. Michaels is local and family owned. Not a franchise or owned by an out of town business or a utility conglomerate. 100% of our income stays in the local economy, enabling you to get the highest standards of workmanship at a price you can afford. When you do the job right — especially the tough jobs – word gets around. Since 1978, we’ve been building our business on referrals from satisfied customers throughout central Maryland. And because we’re a locally based and family-owned company, you don’t have to wade through multiple layers to reach the people you need. Whether it’s a quote, a question or an after-hours emergency, you’ll get through to someone who can help — quickly. Our experience starts at the top. Michael Giangrandi, our president, has led the company from Day One. Our mechanics, field reps and technicians average well above the usual industry education and experience. In fact, you can meet the team and find out more about the people you'll be working with. And that experience can literally pay off for you. Not only do we understand the tax breaks and financial incentives offered through federal and state programs, we've participated in the development of energy saving and special financing programs under the EmPOWER Maryland Program. We've earned a reputation for successfully tackling the toughest challenges, again and again. 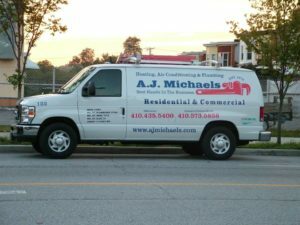 Because of our expertise, we've been called in on some of the most difficult heating, cooling and plumbing projects: from churches to cruise ships; from factories and offices to homes that supposedly can't support central air conditioning. We believe in doing it right. We don't use subcontractors. When you choose A.J. Michaels, you get highly trained experts from A.J. Michaels — and nothing less. We don't consider a job finished until our degreed engineer has inspected it. And we won't recommend any kind of solution until we've carefully looked at your home or business and listened to your needs. So what can we do for you? Whatever the challenge, A.J. Michaels can handle it. There’s no doubt about it. We're here for you seven days a week with no extra charges for nights or weekends.